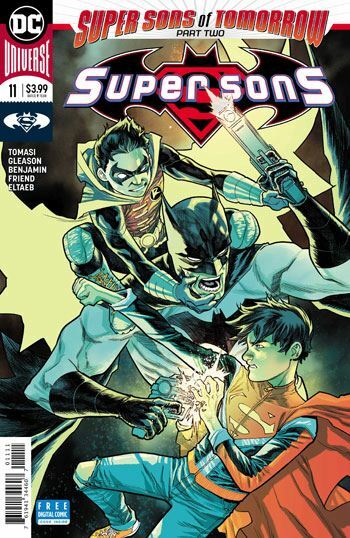 Super Sons 11 is part of a larger story arc, crossing over with the Teen Titans and Titans, so it is hardly a surprise that the story opens with Superboy and Damien with the Teen Titans. This issue is also less playful than previous issues of the run. That makes sense, and I didn’t mind it at all. There are still some great lines along the way. The Teen Titans find themselves under attack from someone who looks like Batman, but turns out to be Tim Drake. 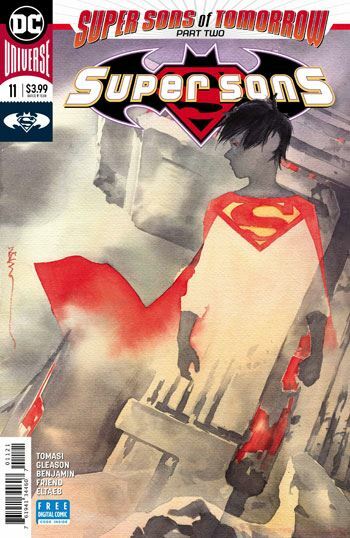 This is a heavy action issue, with Jonathan Kent in the crosshairs, building to one heck of a final page reveal. I wish I could give this one unqualified praise, but I honestly thought some of the art looked sloppy and rushed. Hard to tell, though, as the stylization might simply be the cause of it looking that way to me. Either way, though, not all of it worked, in my eyes. The first panel on page 8 was where I noticed this. Raven’s breasts are massive, and oddly placed, and what happened to Aqualad’s leg? Although I am not quite sure where this story arc is going, by the end of the issue it becomes apparent that this is a really major story, and I am quite excited to see what develops.